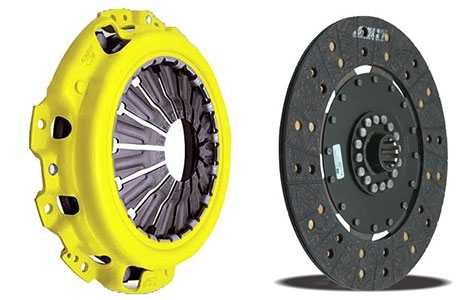 ACT's 2100 Heavy Duty Clutch Kit includes ACT's very popular pressure plate, which uses an exclusive diaphragm design to increase clamp load, reduce deflection and maximize clutch life. All diaphragms endure a four-stage, heat-treating process for unparalleled performance. ACT pressure plates have precision cover stampings to provide rigidity and consistency. ACT's Performance Street discs feature premium organic materials with high copper content for better heat transfer and steel-backed lining for greater burst strength and durability. The chrome-moly hub is heat-treated for strength and durability. The 2100 clutch kits also include a Monoloc Collar designed specifically for Evo's. This Monoloc Collar is a one-piece, direct replacement or upgrade to the standard, two-piece wedge collar and wire ring featured in pull-type clutches. The spring tension of the segmented retaining ring is carefully calculated and tested for optimal performance. This provides for uniform loading on the bearing and pressure plate to assure proper alignment, regardless of driver influence or vehicle modifications. The Monoloc's hardened chrome-moly steel construction will provide years of service. The 4-pad rigid race discs are made with high quality, ceramic friction materials. The engagement is harsher and there is some "chatter" (noise) associated with these clutches, but its this design that enables for smooth, quick shifts at high RPM's. The 4-pad rigid race disc is well suited for the smaller disc sizes in smaller engines. The 4 Puck Sprung option features a spring-center race disc to properly dampen torsional vibrations for quieter operation, and resist failure even under harsh conditions. ACT spring retainers utilize wraparound spring windows and thicker retainer stampings to provide spring support, reduce stress concentrations, and increase strength and reliability. The 4-pad spring-centered race disc is well suited for smaller disc sizes in smaller engines. The 6 Puck Sprung option features a spring-centered race disc features a spring-center construction to properly damp torsional vibrations and resist failure under harsh conditions. ACT spring retainers utilize wraparound spring windows and thicker retainer stampings to provide spring support, reduce stress concentrations, and increase strength and reliability. With the 6-pad spring-centered race disc engagement is harsher, but shifting is faster. The 6-pad spring-centered disc is recommended for larger clutch sizes to absorb more heat. ACT's 2100 "Heavy Duty" Clutch Kits provide a smooth, stock-like pedal feel, and include a one-piece Monoloc Collar designed to provide uniform load on the bearing and pressure plate. **Available in Street Disc, 4-puck, and 6-puck configurations.